While stock templates are a great start to building an attractive email campaign, it's impossible for them to truly capture the unique spirit of your brand. You can save thousands of dollars on professional design services by having our in-house team of designers give you the personalized look you need to really stand out. Our template services group can take your existing logo, brand colors, collateral or website and turn it into a beautiful and creative design, saving you time, money and the hassle of finding creative services on a budget. Custom templates start at $299 each, which covers five hours of development time. Just give us a call or fill out our Custom Template Creation form to learn more. 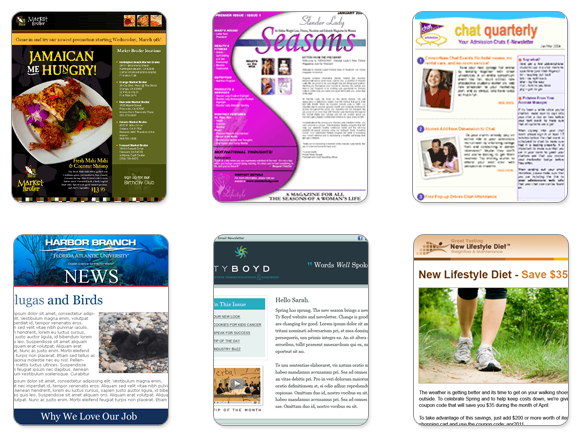 Price: $299 per email newsletter or promotion.